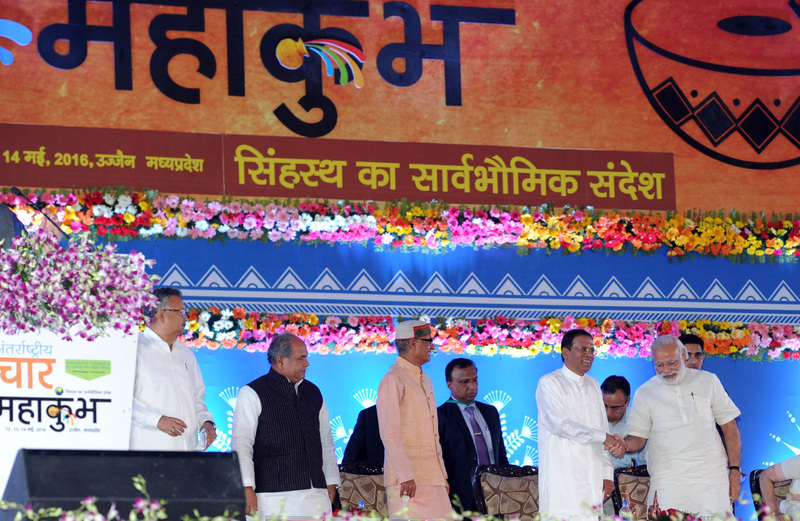 The Prime Minister, Shri Narendra Modi shaking hands with the President of the Democratic Socialist Republic of Sri Lanka, Mr. Maithripala Sirisena, at the International Convention on Universal Message of Simhastha, in Ujjain on May 14, 2016. The Union Minister for Mines and Steel, Shri Narendra Singh Tomar, the Chief Minister of Madhya Pradesh, Shri Shivraj Singh Chouhan and the Chief Minister of Chhattisgarh, Dr. Raman Singh are also seen. During Maha Kumbha Mela at Ujjain PM Modi and Sri Lankan President shakes hand and Global declaration of Simhastha Declared.